Like all good industry trends, the Fourth Industrial Revolution (4IR) for manufacturing has come to mean many things. While most would agree that it involves the incorporation and interconnectivity of new technologies across production systems, questions remain around the business case to actually implement these solutions. In a recent survey, manufacturing leaders cite “high cost of scaling” and “hard to justify business case without short-term impact” as top reasons preventing the full adoption of 4IR technologies across the enterprise. But are these roadblocks well-founded given the advances in the 4IR? Innovations in manufacturing are far more accessible than many leaders realize. As the futuristic possibilities of the 4IR are discussed, a number of myths have also emerged that are holding back the transformative potential of this new era in production. Below are four of the most significant myths. Dispelling them has the potential to accelerate the adoption and integration of 4IR solutions and unlock its inherent benefits for production industries for every region of the world. For decades “technology” and “innovation” have been synonymous with “expensive”. Whether it was the first DVD player, flat screen TV, or tablet computer, the early iterations of these technologies tended to come with high price tags. However, the beauty of the 4IR is that so much can be done without breaking the bank. For example, by connecting analytics software packages to a “data lake” consisting of existing plant data, in combination with data captured from comparatively inexpensive Internet of Things (IoT) devices, companies can generate insights from enormous amounts of actionable data to make themselves more efficient and more agile. While this does require a significant amount of upfront work to implement, it typically translates into optimized processes, shortened cycle times, increased quality, reduced energy losses, shorter downtimes due to maintenance, and improved overall equipment effectiveness. Even when we consider more capital-intensive 4IR investments like advanced robotics, the cost/benefit continues to move in favour of manufacturers implementing these technologies. Not only are prices of robots and automation falling, but they are doing so as labour costs increase and robot capabilities are increasing. For example, robots’ axes of operation – for example, the range of motion for robotic arms – have increased six-fold in the last 25 years; their user interface is such that line operators can adjust their behaviour and operation “on the fly” with recordable programming; their capability to support human operation has increased as safety standards have increased; and advances in AI continue to lower the cost of the integration of such systems. Global manufacturers understand that the latest machinery, equipment, robotics, and so on, would drastically transform the way they do business. However, there’s also a broad awareness that refitting an entire factory requires significant investment. 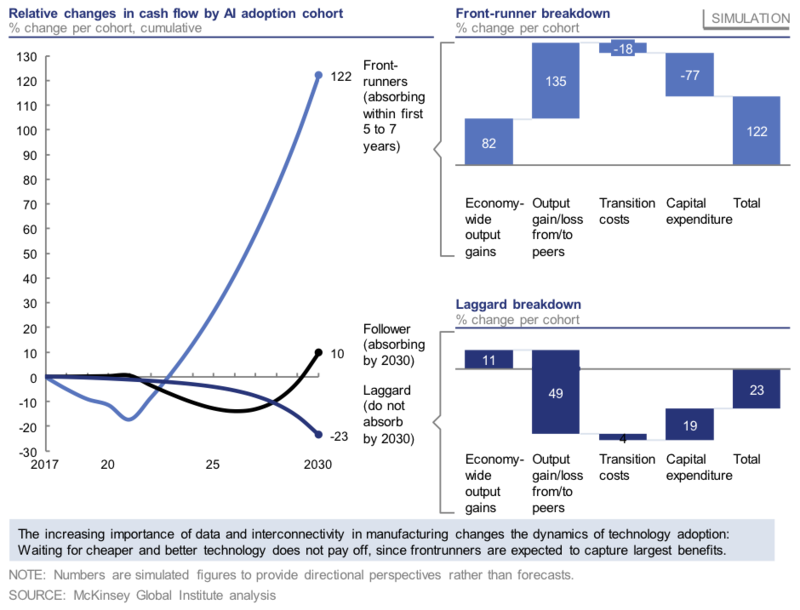 Therefore, some manufacturers wait for technology prices to drop further before investing in a broad scale-up. But, this “smart follower” strategy does not seem to pay off in the 4IR due to the different economics related to data and connectivity. 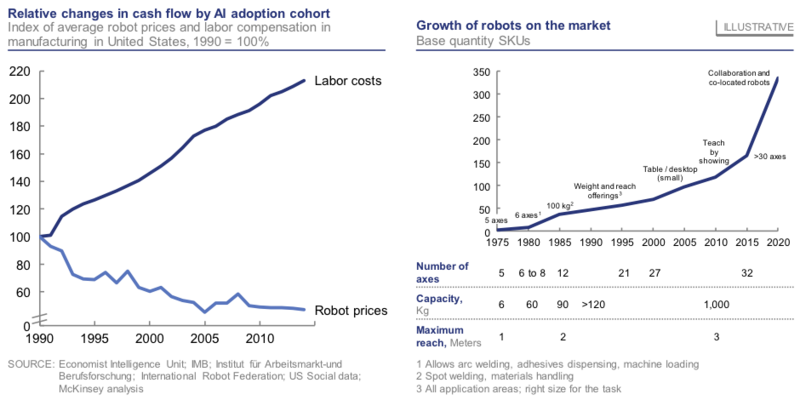 A McKinsey Global Institute simulation suggests that the frontrunners in adoption of artificial intelligence, a key 4IR technology, will increase their cash flow by 122%, while followers will see only a 10% cash flow increase. The key driver is that higher transition costs and capital expenditures of the frontrunners is over-compensated for by output gains. The 4IR in manufacturing is often associated with robots and smart algorithms taking over tasks from humans, creating “lights-off factories” in which humans are no longer needed. This vision fosters fear of massive unemployment and social unrest. While there is no doubt that repetitive tasks will decline, recent reports provide a more positive outlook for the workforce: “The Future of Jobs” report by the World Economic Forum shows that 75 million jobs will disappear and 133 million new jobs will be created by 2022 due to the 4IR, across all geographies, industries and functions. Not only will there be more jobs, but the new jobs will also be more attractive compared to the disappearing jobs, with more diverse and challenging tasks, and a higher emphasis on creativity, problem-solving and interpersonal communications skills. In manufacturing, while we expect a decline of tasks for assembly and factory workers, material handlers, quality inspectors and maintenance technicians; this decline will be counterbalanced by an increase of roles in the fields of data analytics, artificial intelligence, software and application development and technologies. 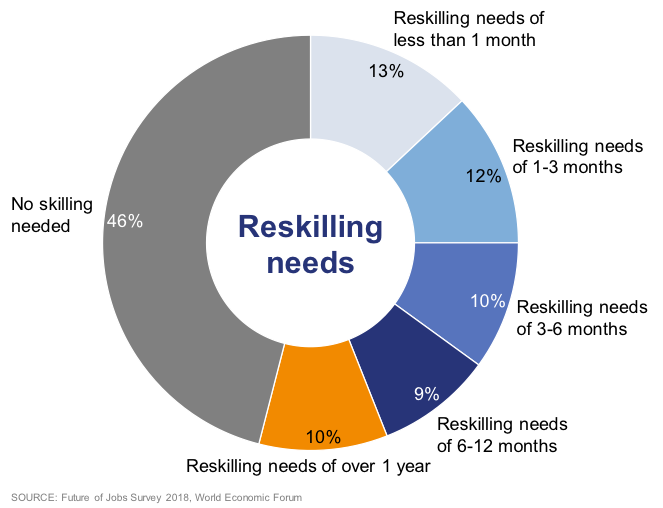 The challenge to be overcome, then, is how to re-skill the existing workforce. Efforts to build capabilities are at the forefront for leading organizations. So-called “lighthouse” examples from some of the world’s most advanced 4IR factories are investing significant resources on change management and upskilling their workforces, with digital academies being deployed to train a large share of their employees. These re-skilling endeavours are supported by the fact that new technologies are becoming easier to implement – for example, employees without IT backgrounds can learn how to develop apps using code-free app development platforms, and collaborative robots can be “trained” without programming. Without doubt, the 4IR has a huge disruptive potential on the workforce in manufacturing. It is essential that more organizations take an active role in reskilling their existing workforce; that individuals approach lifelong learning proactively; and that governments assist in these efforts; to ensure that the workforce and society will benefit from the opportunities that are brought by the 4IR. It is well-accepted that implementing more advanced technological solutions can help make businesses more efficient and therefore more sustainable. For many business leaders, talking about sustainability remains either a marketing strategy, or a signal that the company is going to forgo greater profits to become more “green”. It is this mindset – that one must choose between what is right for the bottom line and what is sustainable – that must shift. To do this, we need to first change the way we think and define sustainability. Today, it is far more than planting trees or putting a few solar panels on the roof – although these are still good things to do. Instead, we need to think about sustainability in terms of sustained success, and in the broader context of contributing positively to the workforce, society at large, and the environment. Equally important, becoming sustainable does not have to mean massive changes. For example, the installation of intelligent lighting controls can save over 40% of energy used in lighting, and a building energy management system to optimize a plant’s energy use can save up to 30% of energy consumption. Some of the easiest savings can be made through managing off-time schedules more accurately. There’s a common understanding that only large multinational companies in developed markets can deploy and benefit from 4IR technologies. 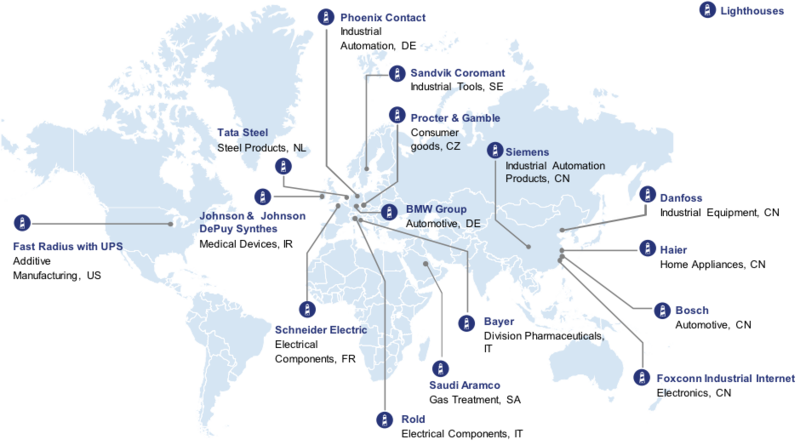 This is not always the case, according to a recent World Economic Forum white paper “Fourth Industrial Revolution: Beacons of Technology and Innovation in Manufacturing”, which details 16 of the world’s most advanced 4IR factories. For example, one of the “lighthouse” factories is owned by Rold, an Italian SME with 250 staff, which implemented 4IR technologies with a small team and limited investment. The company created full transparency of its production process in order to identify and resolve root causes for quality deviations and performance losses. After only one year, the company achieved 7-8% revenue growth, enabled by an 11% increase of the overall equipment effectiveness (OEE). In addition, the network of lighthouses shows that 4IR technologies are not the exclusive domain of developed economies. In fact, China is one of the leaders, with a high number of lighthouses, and other lighthouses are located in Eastern Europe and in the Middle East. If manufacturers can collectively come to see these four myths for what they are – self-imposed barriers to attaining new heights of success – then we may finally unlock the full potential of the 4IR for industry and usher in a new era of innovation, productivity and inclusive growth.